Why not celebrate by snuggling with your very own Tom Cat or Jerry Mouse from Steiff! Tom and Jerry represents the ultimate game of cat and mouse. These feuding friends have been through a lot throughout the years: from being the bitterest of rivals to the best of buddies, in their house and in outer space. Even though this duo has altered over 8 notable eras, Tom and Jerry are still as lovable as ever. These collectibles look pretty cool. I've seen some of the plush toys that have been released over the years, but nothing compares to these, obviously considering the price. Speaking of which, they are a bit pricey so these aren't the toys you are looking for. 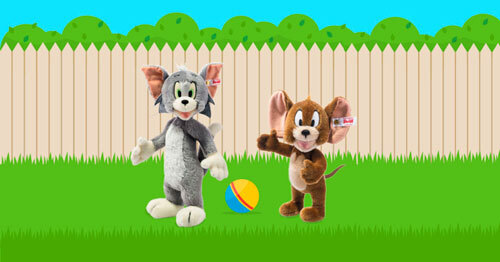 The market for these Tom and Jerry collectibles are for, well, the collector. They are also limited in quantity to about 2,000 pieces.